• Quality materials make conversion more durable, giving you longer life, and a better return on your investment. • Most user friendly conversion available. and a greater ease of use. feeling when riding in the traditional raised roof conversion. 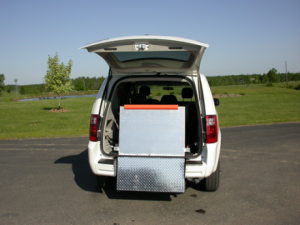 Extremely sturdy yet lightweight ramp slides away inconspicuously into rear hatch of the van. 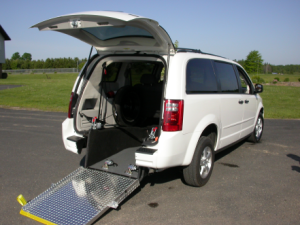 Dual locking mechanisms lock ramp into place during transit. 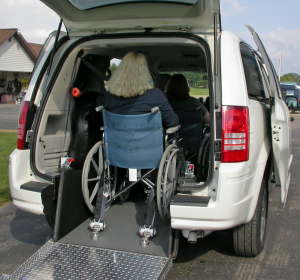 A ramp width of 34.5 provides enough space for most wheelchairs or power chairs. 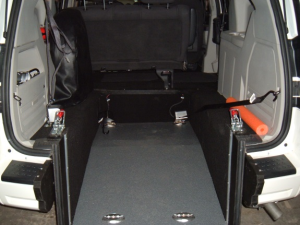 A gradual ramp grade and direct line loading makes for a smooth and easy transition. 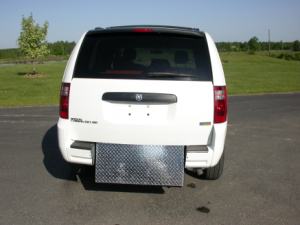 in both front and rear positions. 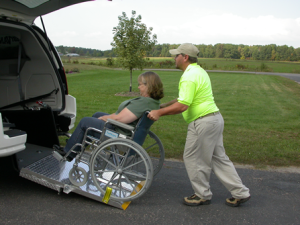 Mechanical or Electric restraints available. 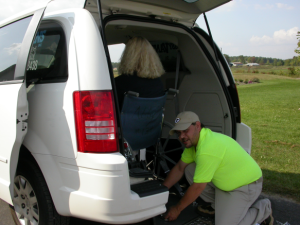 The one wheelchair conversion offers a spacious passenger compartment able to accommodate one wheelchair and three ambulatory persons.